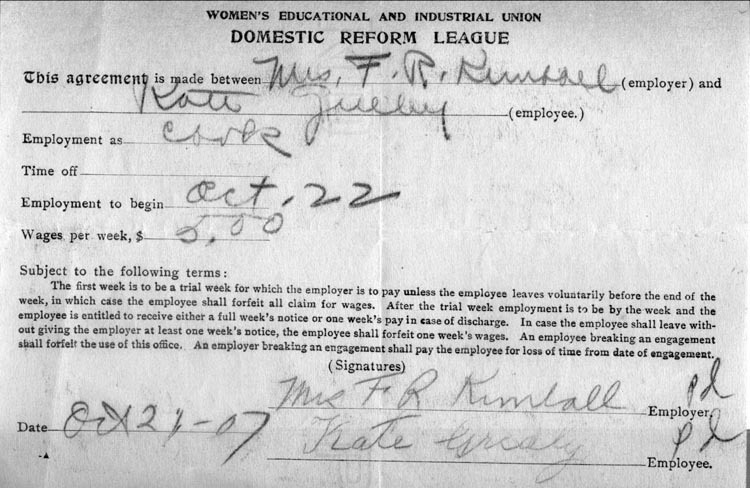 This agreement is made between Mrs. F. R. Kimball (employer) and Kate Grieby (employee). Employment as Cook. To begin Oct. 22. Wage per week $5.00. The first week is to be a trial week for which the employer is to pay unless the employee leaves voluntarily before the end of the week, in which case the employee shall forfeit all claim for wages. After the trial week, employment is to be by the week and the employee is entitled to receive either a full week's notice or one week's pay in case of discharge. In case the employee shall leave without giving the employer at least one week's notice, the employee shall forfeit one week's wages. An employee breaking an engagement shall forfeit the use of this office. An employer breaking an engagement shall pay the employee for loss of time from date of engagement. Are you looking for GRIEBY ancestors? If so, we suggest posting a query to our Community Message Board to get assistance from other researchers.